Over the weekend I went out with a couple girlfriends and I spotted a girl wearing this blouse. Obviously I had to stop her and ask where she had bought it. I also stopped a girl to ask her how and with what she curled her hair (is it weird that I do that?). Turns out the blouse came from the very affordable Dynamite. It is a Canadian store so sorry international readers! I stopped into my local Dynamite and sadly they were sold out of my size. I'm so obsessed with the blouse that I've emailed the corporate office to see if they will be getting more stock. Lets see if they answer my email. You can see it HERE. It retails for $29 but sadly they don't do online shopping. oh how i LOOOVE that!! Cool. And I think people are flattered when you ask about their clothes. I know I'd be! 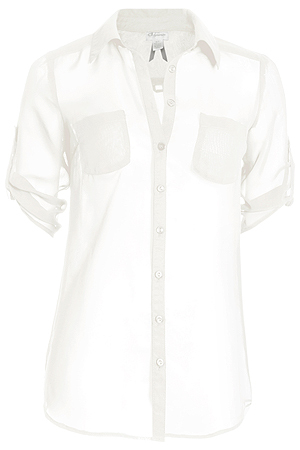 It is a lovely blouse - the combination of chiffon with a very classic cut makes it so wearable. Hope you get your hands on it! It looks like the perfect thing for summer! Cool! I like it. I love the sheerness of it. And girl, you can stop me and ask me about my clothes or hair anytime! And I'll love you for it. P.S. Love the mint green polish from the last post. It was one of my favorite nail polish shades last summer! What a gorgeous blouse-damn no online shopping! what no online shopping?!? Why do you tease me so! That blouse is absolute perfection. And I always ask people where they bought stuff and what they do to their hair or makeup. It isn't weird at all. Classic shirt! Hope you find it! so cute! so versatile! and $29?!?!?! they would sell 4 million of these if they had on-line sales! 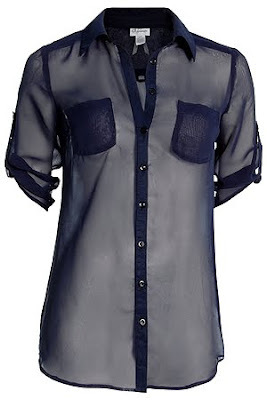 This looks like a great blouse that will go with everything this summer! I hope they restock it for you! I WANT it in navy!! And what a great buy!